An analysis of apps in the Apple App store by price, ratings, etc. Some interesting insights, including that 60% of the apps in the app store have no ratings. WWDC 2014 tickets will be offered via a lottery You have until 10am PDT April 7 to register for a chance to attend, and people will be notified that evening. Given the limited size of the conference, which has maxed out at 5000 attendees to maintain a 5 attendees-per-Apple-engineer ratio, this is my first chance to go in years. This analysis of Apple’s Arm processor micro architecture suggests that there is a lot of untapped power that iOS apps aren’t using yet. This new tool provides a quick way to generate code to animate iOS transitions. With Amazon’s new Fire TV and a rumored new offering from Google soon, this may very well be the year that iOS apps move to the Apple TV. The LA Times compares the current crop of TV boxes here. Clearly the streaming media race is heating up: Amazon is rumored to be going after Spotify with a new streaming subscription service soon. Speaking of Spotify, their newest version on iOS is beautifully designed, and very in-line with the iOS 7 aesthetic, with a content-forward look-and-feel. I haven’t had time to completely explore it, but really like what I see so far. Microsoft has announced Cortana, their answer to Siri and Google Now. While the reference to the character from Halo probably resonates with the Xbox crowd, it seems like an obscure choice to pick for an already underdog mobile platform. I had no idea who Cortana was myself, having never played Halo. The interesting thing about the feature is that it’s powered by Bing — this may be the time for Bing to actually shine, the Bing team has some great technology that has been largely ignored, but maybe mobile is the right venue. The comics medium has been used for journalism for a while now. Joe Sacco’s Palestine is a prime example; a personal and immediate first-hand account of life in the occupied territories. 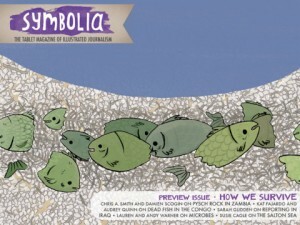 Symbolia magazine takes this form of journalism to the iPad as a Newsstand app. Symbolia is available in the iOS App Store. Download is free, an annual subscription is $11.99 for 6 issues. Single issues will run $2.99. 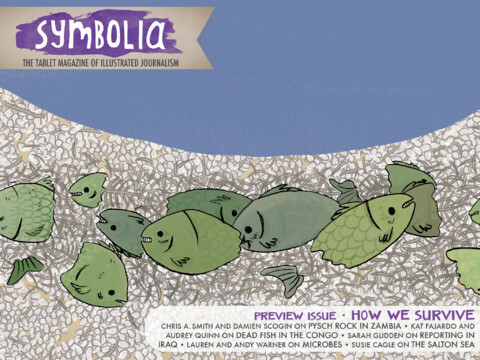 The app comes free with the preview issue, which showcases Susie Cagle’s piece on the Salton Sea. Newsstand Icons are rendered differently from normal apps, like the Zinio icon at left. Apple’s Newsstand is a very underrated iOS feature. Newsstand apps are essentially iOS apps with additional privileges that allow pushing of new content to your device so that the latest issue is available to you offline. Apple hasn’t promoted Newsstand much, but there are an impressive number of major titles available, including the New York Times, Sports Illustrated, Esquire, Wired, and others. You can easily differentiate Newsstand apps from others on the app store by their icons; instead of the rounded square icons, Newsstand apps are rendered to look like magazines or newspapers. It’s a good thing, too, as the ‘store’ feature in Newsstand is kind of broken. Ironically, today News Corp. announced that they are shutting down The Daily, but tablet-based magazines such as Symbolia and Marco Arment’s The Magazine seem to be gaining momentum. The Magazine is already profitable, has hired an editor, and increased its rates for writers. The economics of these magazines are very compelling in comparison to print magazines, and the barriers to entry have never been lower. Why are Android users less engaged than iOS users? Nice detailed graphs and links to several good stories on the topic. I do take issue slightly with the idea that “willingness to buy stuff == engagement”; everyone buys devices for different reasons. But if you are writing shopping apps or marketing your business on mobile devices, it’s important to understand the different types of users and the strategies that work best on each platform. IDC: Developer Disinterest Could Kill RIM & Windows Phone Ya think? Out of all of the companies I’ve interviewed lately, only a couple are planning to put their apps on Windows Phone, and nobody is planning to support BlackBerry. 11 Apple iPads per hour vs. zero Microsoft Surface tablets Schadenfreude aside*, this is a significant indicator about what a misstep it has been for Microsoft to sidestep its OEMs. They don’t have nearly the distribution network they need to go it alone. Also, Surface exemplifies how badly MS has misread the tablet trend; it’s not about the hardware, its about reducing the computing experience to something that is quick and pleasurable. Shoehorning desktop Windows onto a tablet barely capable of running it fails both tests. *Actually, I’m not enjoying this at all, I’m a Microsoft shareholder, and my investment has seen no growth, while my Apple stock has gone through the roof. Steve Ballmer has got to go. In BII MOBILE INSIGHTS: Mobile Technology May Define The Future Of Healthcare, PriceWaterhouse Coopers presents a video talking about how mobile is influencing healthcare. The other links/reports on this page are pretty good, too. Apparently apple has already patented one of the things on my personal wish list for the iPad: a conductive stylus that transmits pressure and or tilt information. This type of a pen would basically turn the iPad into something like a Wacom Cintiq, at a fraction of the cost and with far better portability. Up to now, drawing on the iPad has basically been fingerpainting, though several of the drawing apps have taken some novel approaches. Sketch Club, for example, can use your drawing velocity to control the line. Though there are styluses which you can use with the iPad now, none can support pressure or tilt sensitivity. Because of the way the iPad handles touch events and gestures, this has to be directly supported in iOS. While many of the drawing programs for the iPad are already pretty good, pressure sensitivity is a must for any serious professional drawing program, especially those that mimic traditional art materials such as charcoal. This article goes into a lot more detail about their approach. This particular approach requires a special pen with a conductive disk tip that can trigger the touch panel sensors more effectively. Attention to detail is very important in the user experience for mobile apps. Here’s an example (courtesy of Daring Fireball) from the iOS email program. It’s a small thing, but these behaviors add up to a very polished whole. This blog, ‘The Invisible’ is brand new, with just two postings, but is a very promising look into the little details which drive the fit and finish of user interfaces. The first entry, about tab closing in Google Chrome, is also very enlightening. More info on Engadget.com, including some pics from the RIM conference. The demo video is fairly interesting, they appear to have cribbed a lot of UI concepts from Palm’s WebOS. All in all, it looks like a good offering; if you look at it as sort of an accessory to one’s Blackberry, it could get a lot of traction amongst Enterprise customers, even if the Blackberry app store doesn’t expand dramatically. They have borrowed liberally from iOS user inferface concepts, and the device does appear to be very responsive. What they don’t talk about is the price. Of course, there are a lot of questions about app availability as well, most Android Market apps will need rewriting to use the unique screen size, and it’s not clear it will have Android Market. Based on how sluggish the UI is, how many buttons the device requires to support Windows (a Ctrl-Alt-Del key? Really? ), and the obvious lack of touch integration in the OS ( you have to press a button to make the keyboard appear for text input) this device is too little, too late. Personally, I don’t think the 7 inch devices will prove to be a big hit. You are talking about a device that’s bigger than a phone, but smaller than a paperback book. While it can support the split-view type interfaces we’re seeing on the iPad and in Sencha, they’re still kind of small for displaying a lot of information. The larger screen of the iPad is just a lot more real estate for displaying information, and given the limitations of the touchscreen input resolution, gives you a fairly precise pointing mechanism at a low price point. I don’t buy the rumors that Apple is going to introduce a 7 inch iPad, their decisions for the size and form factor for the first-gen device were not arbitrary. At its current size, the iPad’s screen is small enough to be a portable device (think replacement for a clipboard), but large enough to display lots of information and allow for very immersive UI interactivity. Prcing is going to be an issue for all of these. With the current benchmark being $499 for the entry level iPad, there just isn’t a lot of room for price competition, especially since analysts believe that Apple could drop the price by $100 or more and still turn a profit. Right now, the phone-call-enabled European version of the Galaxy Tab is said to be priced at 700 or 800 Euros, or 679 British pounds. With contract, this is going to be lower, but who wants to commit to a multiyear contract for a device that is more of an accessory than a primary device like a laptop? Hope that HP unveils their WebOS tablet soon, I assume it will hit much closer to the mark than the Slate, which appears to have been cancelled for a very good reason. Parsing the latest Apple earnings.